Julie Andrews (1935 – ) British actress, dancer and singer. 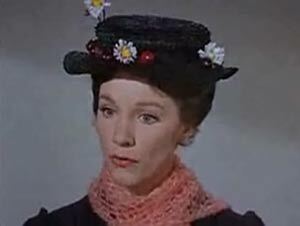 She is best known for her iconic roles in Mary Poppins (1965) and The Sound of Music(1966). In addition to these two films she has enjoyed a rich and varied career as entertainer and singer. 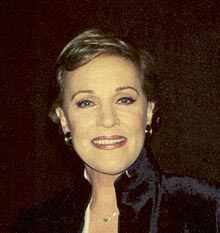 Julie Andrews was born on 1st October, 1935 in Walton on Thames, Surrey, England. She was brought up in humble surroundings. At a young age, her parents were divorced and she was brought up by her father, her mother (Barbara) and stepfather, Ted Andrews. One of her earliest memories is living through the blitz, sheltering in air raid shelters. It is said that during the air raids, Ted Andrews would often start singing, Julie would also join in singing – a full octave above everyone else. This was the first time her beautiful singing voice was noticed, and her parents took care to nurture and improve her singing voice in her childhood years. Amongst her teachers was the famous concert soprano and voice instructor, Madame Lillian Stiles-Allen. Andrews later revealed that Madame Lillian Stiles-Allen ” had an enormous influence on me,” Andrews said that the relationship was almost like that of mother and daughter. Julie Andrews first experiences of performing came in 1945, at the age of only 10. She was invited to join her mother and “pop” (her stepfather Ted) on stage. She remembers how she had to step on to a crate to reach the microphone. Her first big single performance came on 22 October 1947, when she performed at the London Hippodrome. She performed the testing “Je Suis Titania” aria from Mignon. This difficult piece was from part of a musical revue called “Starlight Roof”. From this point her progress was swift; in the next year, aged only 13, Julie Andrews, became the youngest person to perform in a Royal Command Variety Performance. 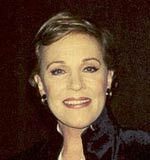 Between 1950-52, Julie Andrews made her break into the fledgeling TV programs, gaining national prominence through her appearances in the show “Educating Archie”. Her international career really took off with her performance in the musical “My Fair Lady”. The musical is based on George Bernard Shaw’s play, Pygmalion. My Fair Ladytells the story of a poor, uneducated London girl from the East End, who is taught to speak like a lady. Given Julie Andrews humble beginnings, there is some parallel with her rapidly blossoming career. Julie Andrews was the undoubted star of the musical and she helped make it one of the smash hits of the year. During her performances in My Fair Lady, she was asked to perform in the 1954 film production of Cinderella. However, when My Fair Lady was made into a movie, Julie Andrews was passed over for the more famous actress Audrey Hepburn. Ironically, shortly after this disappointment, she was given the opportunity to perform in the Walt Disney film “Mary Poppins”. This was received with great critical acclaim and has remained one of the most treasured films of all time. For her performances, Julie Andrews was awarded the 1964 Academy Award for best actress. In 1965, she was also awarded a Golden Globe. In the next year, Julie Andrews played Marie von Trapp, in the classic film production of The Sound of Music. By many accounts, The Sound of Music has been one of the most successful films of all time, and Julie Andrew’s performance is a defining feature of the film. She was nominated for another academy award, but lost out to Julie Christie – Darling as “Diana Scott” These years were amongst the most successful for any actress. After these unprecedented successes, the career of Julie Andrews always lived under the shadow of these two iconic performances. Despite forays into new movies, Julie Andrews admitted she often felt typecast due to the lasting impression left by her performance in these productions. However, she retained a great fondness for her role in The Sound of Music. I saw The Sound of Music again recently, and I loved it. Probably it’s a more valuable film now than when it first came out, because some of the things it stood for have already disappeared. There’s a kind of naive loveliness about it, and love goes by so fast … love and music and happiness and family, that’s what it’s all about. I believe in these things. It would be awful not to, wouldn’t it? In 1983, she received her third Oscar nomination for her performance of Victoria Grant and Count Victor Grezhinski in the film Victor/Victoria. Julie Andrews is married to Blake Edwards, they have three children.